​Welcome to SEE’s professional development program to ​advance student ethical functioning. cultivate a commitment to and describe ethical action. ethical analysis of cases in literature, history or current events. Education's mission has always included the goal to advance an ethical citizenry for our democratic republic. Achieving with Integrity (AwI) provides secondary teachers a teaching strategy that integrates the goal of developing ethical citizens while strengthening student ethical reasoning ability. Reasoning ability is practiced in AwI classes as students analyze academic content (history, literature, science, philosophy, current events) with a shared vocabulary of core ethical values. This analysis is consistent with the goals of Common Core objectives and 21st Century skills. SEE's motto, ethics in action creates character, is fully manifest in the AwI seminars. Students will learn strategies to (1) determine what qualifies as an ethical situation, (2) make an ethical judgment, and (3) commit to core ethical values to demonstrate positive character in an ethical action. Encouraging the aspirational choice of ethical citizenry can become a life purpose for students. The AwI Seminar is a three-lesson professional development series for secondary teachers. It is available to purchase for online completion or in-person professional development. A certification option is available where participants seek feedback and review from SEE and then earn a certificate of completion to meet CEU requirements. AwI strategies are best taught as reasoning and social skills within literature, social studies, science, health or ethics classes. Reasoning skills help develop student ethical analysis, which is one component of ethical functioning. Improved student ethical functioning supports student character formation, and their choices to demonstrate academic integrity and resist other anti-social behaviors. For those seeking to develop National Schools of Character strategies consistent with Character.org's 11 Principles of Effective Character Education, learn more here how the AwI Seminar aligns with multiple Principles. 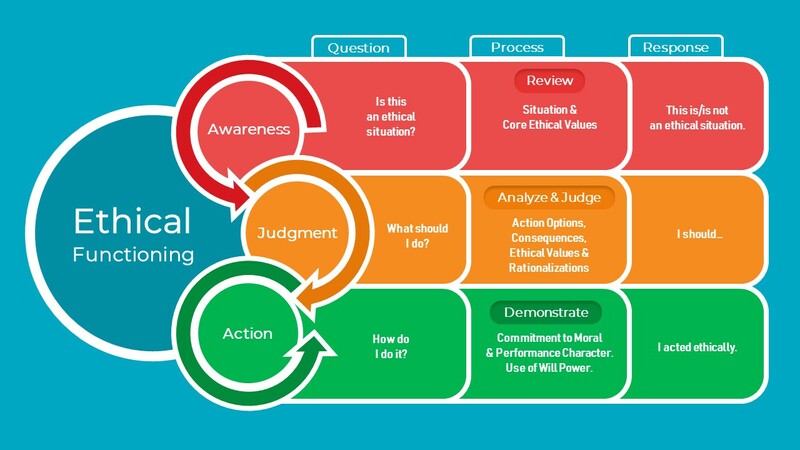 Three multimedia videos or in-person presentation that introduce and then teach concepts from the Tri-Factor Model of moral functioning described in the graphic below. Each video lesson is about 25 minutes in duration. Resources (video and text files) to support the development of lesson plans to introduce and subsequently teach content using the AwI protocol. In-person seminars provide time to draft and discuss lesson plans. Certification option where teachers will respond to each lesson with completed assignments and SEE will document time of engagement by teachers for school districts to grant CEUs. ​All three Achieving with Integrity online seminar videos with SEE review of lesson plans and self-evaluation forms. ​All three Achieving with Integrity online seminar videos with accompanying resources. ​Contact SEE to contract for the Achieving with Integrity Seminar as a professional development workshop at your location. SEE's Tri-Factor Model for Ethical Functioning.